The advent of beautiful fall greens – various red and green, straight and curly mustards, tatsoi, mizuna, and arugula in particular but also beet, kohlrabi and turnip greens among others – prompts braising and combination with other ingredients that calm any sharpness and complement the texture and flavor of the base. 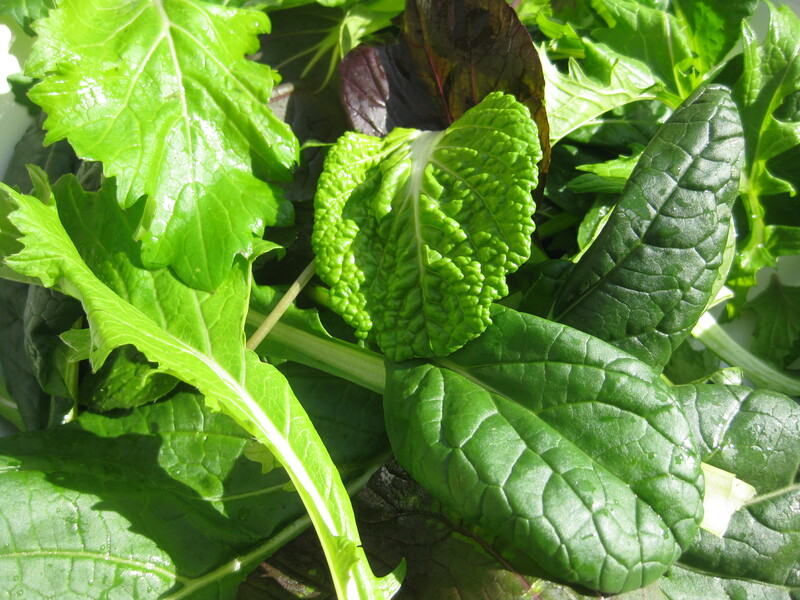 Our CSA farm offers cuttings called “braising mix” that are the fall equivalent of spring’s mesclun. 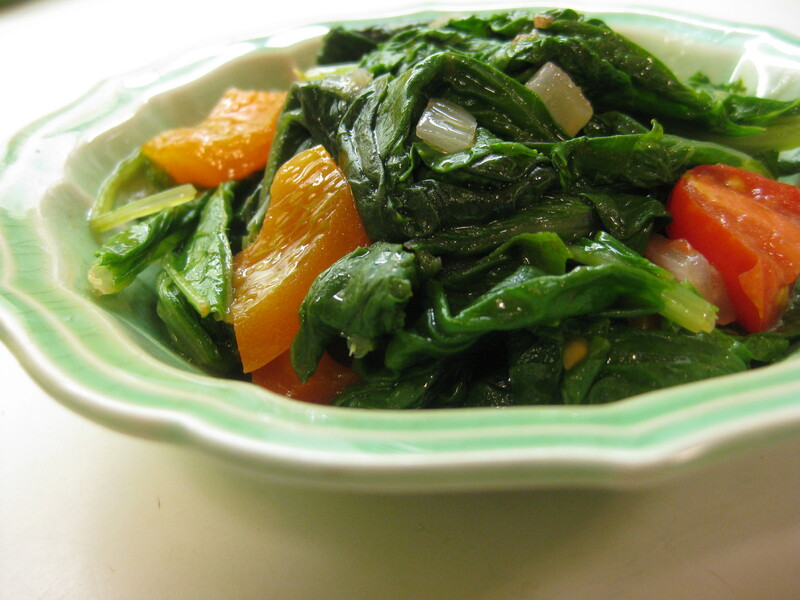 From the name, it is intended to be cooked, but I often add a few of those raw bitter leaves into a fall salad tossed with fruit and nuts. 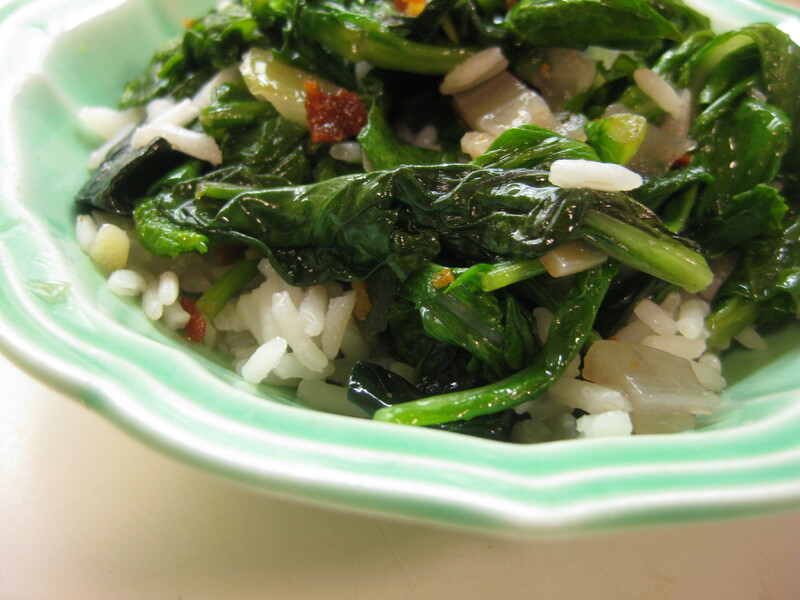 Here are two of countless ways of cooking these bitter greens. The first technique, which I’ve typically used with mustard greens, involves onions, garlic, and chopped peppers and tomatoes, the last of the season. Saute chopped onion and garlic in a little olive oil and add the peppers, cooking until softened. Then add chopped tomatoes (a good way to use up the last cherry tomatoes of the season) and cook slightly. Add the washed greens and cook, stirring, over medium heat until the greens are wilted, adding a little water if necessary (not much since it will dilute the taste). Season with salt and pepper and serve hot. The second uses bacon and cider vinegar. For greens that are to be wilted and eaten raw, I normally cook a small batch of bacon, remove it to crisp, and then sauté onions in the bacon grease, adding cider vinegar to deglaze the pan. With a touch of sugar, this becomes a dressing that is poured over fresh greens. My braising mix was a little strong for a salad, so I added the greens to the mix after the onions had softened a bit and garnished with the reserved bacon. I also added a little pre-cooked rice to make this a more substantial meal.